Gov. Pat McCrory and State Transportation Secretary Tony Tata unveiled North Carolina’s plan for road construction over the next decade Thursday and it includes the long-delayed bridge between mainland Currituck and Corolla. 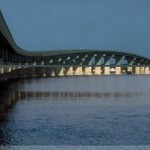 While the Mid-Currituck Bridge’s appearance in the latest draft Strategic Transportation Improvement Plan was met with excitement and hope by local and state officials, it is still not a certainty the 7-mile-long span between the placid community of Aydlett and the bustling beaches of Corolla will be open to traffic before 2025. 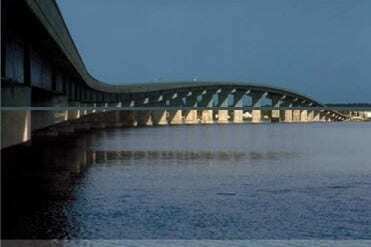 Overall, the bridge will cost an estimated $410 million, with the state contributing $173 million, according to N.C. Department of Transportation spokesperson Jennifer Garifo. The draft plan must still be given final approval in June, about the same time the North Carolina General Assembly will be writing and approving a budget for the next two fiscal years. Inclusion of the Mid-Currituck Bridge project in the plan announced Thursday will not change NCDOT’s main priority in the region — building a new Herbert C. Bonner Bridge over Oregon Inlet. The state has been ready to start construction, but litigation has delayed the project. State and federal agencies are now negotiating on a compromise that will get things started. Fearing, a Manteo resident, is the Division One representative on the N.C. Transportation Board. Nearly 1,100 projects across all transportation modes statewide are fully or partially funded under the Strategic Transportation Investments law, which created the Strategic Mobility Formula in the most recent session of the General Assembly.